Get a long row of elegance on your ear in one blow. This helix piercing knows excactly how to do that. The shape and the way the crystals are arranged make this jewel a real piece of eye candy. The crescent is quite big, 2 centimeters long and almost 1 centimeter wide. The six crystals are Princess cut. It means that they are long shaped with flat cut sides. The holder of these crystals has an opening on the back for each crystal. It allows the light to go its own way. As there are six crystals in total there is always one that is glimmering. TAKE NOTE! 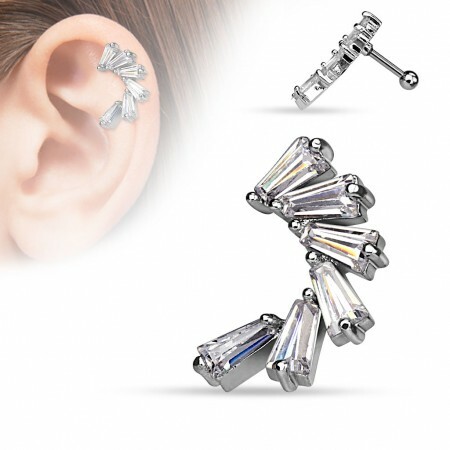 Due to the curvature of this piercing is should only be worn in the left ear.